23rd Street & Buon Italia in Chelsea Market on 15th Street. I thought I've seen it all but both experiences were incredibly mind boggling to this food junkie. From farm produce to sweets from seafood & fish to meats & charcuterie from cheeses to pastas, it was more than my mind & my eyes could absorb. The food displays tempted you so there was the urge just to reach into the display case. We drove home laden down with fresh Morels, Pea Ravioli made right in front of your eyes. Imported Bucatini Pasta, Squid Ink, Buffalo Mozzarella, Rosemary Breadsticks & never ever frozen Yellowfin Tuna which comprised last night's dinner. We could have continued to shop, until the bankruptcy police dragged us away. In no way was this your average daily shopping experience. 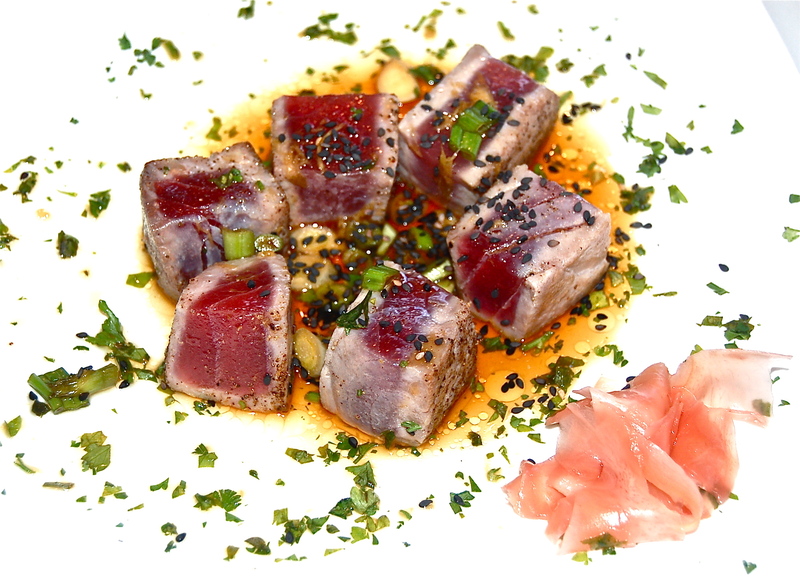 RECIPE  Yellowfin Tuna with Black Sesame Seeds & Asian Sauce. 1. Cut the Tuna into 1 1/2″ pieces. 2. In a large non stick frying pan heat the Peanut Oil. 2, When the oil is just starting to smoke, add the Tuna a few pieces at a time. 4. Turn the other side & sear again untouched for another 15 seconds. 5. Continue until all the Tuna is seared. 6. You will have lovely Tuna on the very rare side. 7. Plate & drizzle with the Asian sauce & sprinkle on Sesame Seeds. 3 TB of Scallions white & green diced into 1/2 pieces. 2. Drizzle on to the plated Tuna & bring what remains to the table.